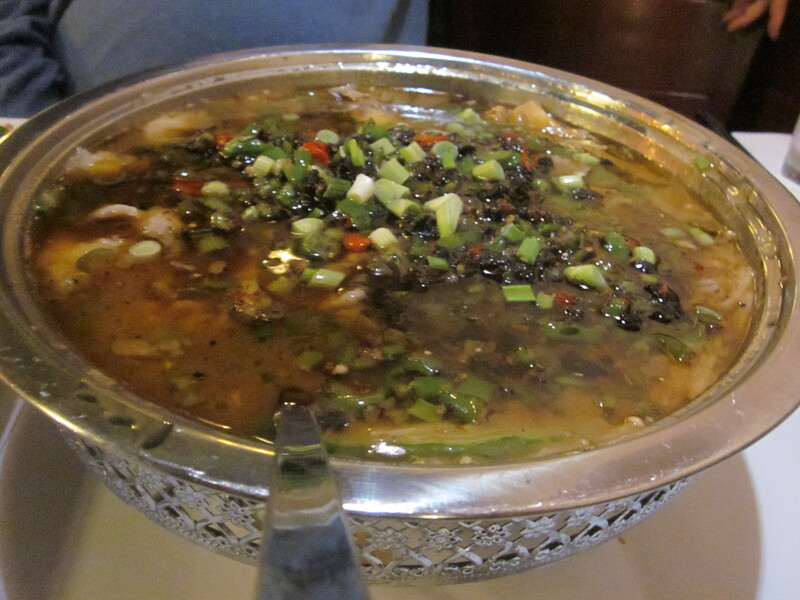 I was curious about the connection between Szechuan food and France that could have spurred the curiously named restaurant La Vie en Szechuan that Zio and I visited on a slushy March evening. 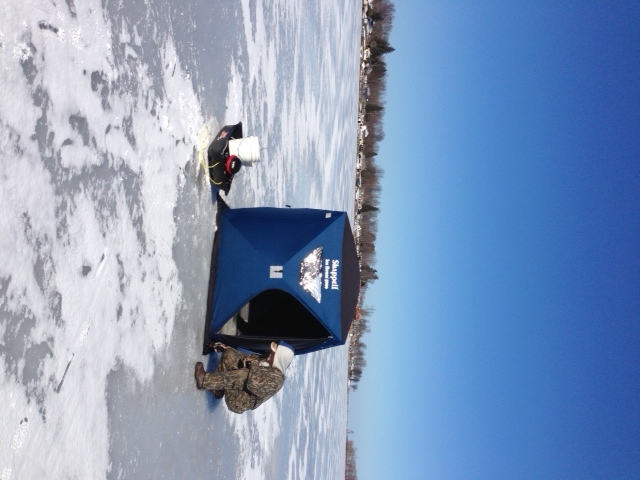 It was supposed to be a get together of Hawkeye, Fonzie and The Coach (see Hawkeye, Fonzie and the Coach Eat at Margie’s) but Fonzie, also known as Gerry, surprised us all by sending a text earlier on the same day we were to meet stating that instead he was going ice fishing. At first I thought this could only be another of Gerry’s sick jokes; after all, the idea of sitting outside in frigid temperatures in the middle of nowhere waiting for something to nibble your rod through a deep hole in black ice could not possibly be more enticing than choking on hot peppers with two of his fellow gluttons. After some prodding, however, we found out he was indeed serious. We were getting close to the end of this very long winter, but Gerry wanted more. And who were we to deny him his pleasure—not matter how perverse it might be? Upon entering La Vie en Szechuan, I looked around the dining room for some connection to France in décor. There was none. I peered at the clientele dining in the restaurant. No Edith Piaf lookalikes anywhere. And then I scoured the thick book that passed as the restaurant’s menu. There were frogs, but not done with butter, garlic and parsley. There was duck—not confit though. And there was steak. Not with frites, but coated with Szechuan chilies, and your choice of rice, white or brown. Was there a French Connection lurking somewhere? If so, I couldn’t find it. Duck tongues, not duck confit from La Vie en Szechuan’s illustrated menu. Since Gerry had deserted us for arctic climes, Zio and I were somewhat limited on how much we could order. The possibilities were vast, but we were confined to just an appetizer and two entrees. Any more than that and our gluttony would have even raised the eyebrows of the table next to ours who, despite their large party, were holding their own in that department with enormous platter after enormous platter arriving in quick intervals to their table. 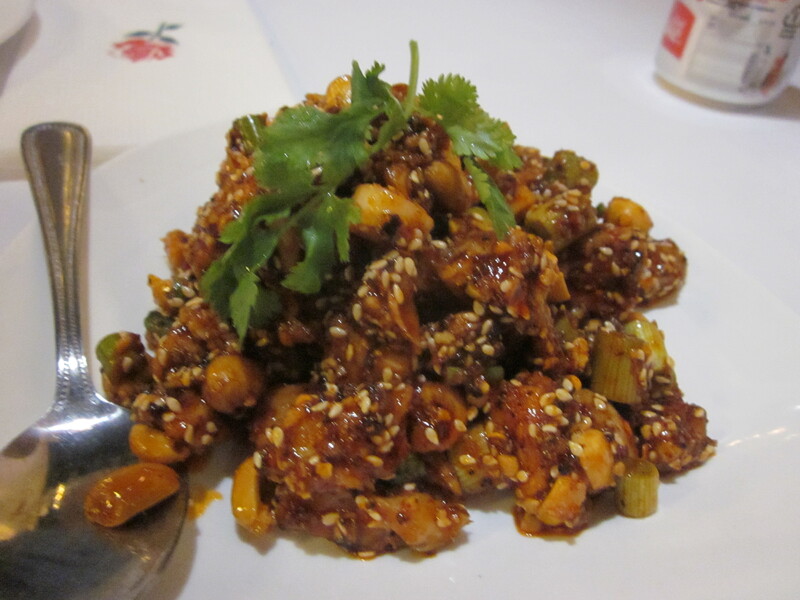 The diced rabbit with chili sauce, we agreed, would make a very good appetizer while I had my heart set on something that caught my eye in the “Signature Dish” section of the tome that was Le Vie en Szechuan’s menu. It was called “spicy chicken with fried dough twists,” and I had to have it just to find out what a fried dough twist might be. Zio’s eyes immediately gravitated to the seafood section and we settled on the braised fish in black bean chili paste. I stuck with water, but Zio requested his traditional diet Coke with lime only to be very disappointed to be told that they had no limes at Le Vie en Szechuan. I’m not sure if the addition of lime to his diet Coke would have done anything to alleviate the sinus clearing heat we were experiencing from the room temperature diced rabbit. I know my ice water was useless to combat it as my nose began to run and the table napkins soon were all soggy. Diced rabbit with chili sauce. It took awhile, but we eventually got the hang of how best to handle the tiny bones of the diced rabbit. Chewing the tender meat and separating it from the bone with our teeth while keeping it in our mouth and then spitting out the bone. “Maybe we should just eat the whole thing and not worry about the bones,” Zio suggested. It wasn’t a bad idea and a few times I did just that, but the habit was just too unnatural for my westernized palate and instead, piled the bones neatly on my small plate. The chicken with fried dough twists arrived next. “What are those Chinese cheese doodles?” Zio wondered as he looked at the red pepper tinged fried dough. They did look like a cheese doodles, but tasted nothing like them. Instead they tasted just like what was advertised; a piece of very deep fried dough. The chicken pieces that surrounded the fried dough were also fried to crackling dryness; the dish in need of a slathering of something wet, but hot sauce was definitely not an option. Braised fish with black bean chili paste. The huge bowl of fish came last; the tender fish surrounded by glaciers of dried chili peppers that were floating in the very wet, soup like sauce. The two entrees were a good contrast between wet and dry and much more than enough for the two of us. 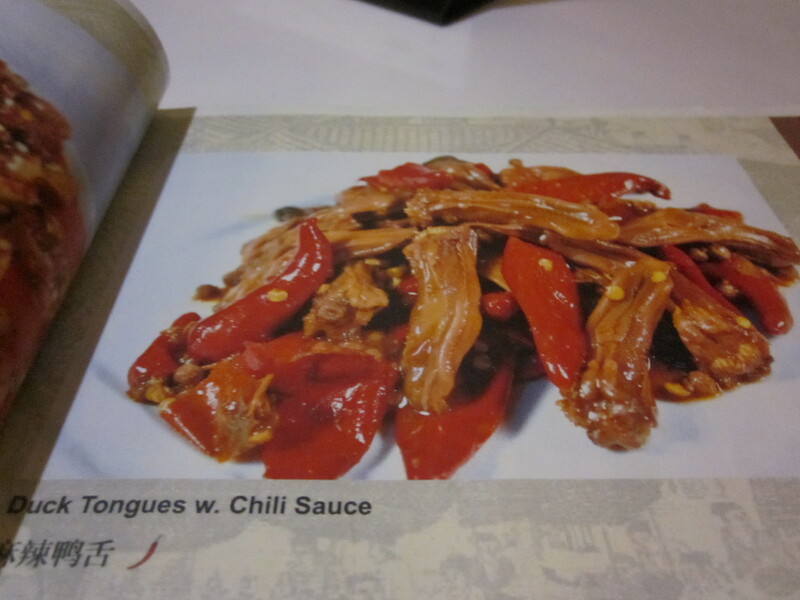 With each piece of fish snared, we also dragged out multiple pieces of hot peppers, never daring to actually eat them. We methodically worked through the bowl but eventually it did us in. 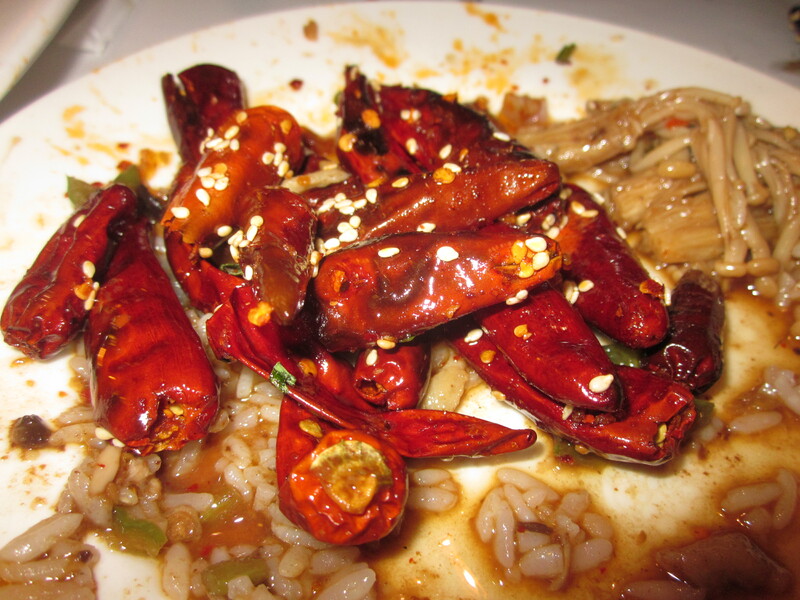 All that remained on our plates were piles of uneaten peppers. When our waiter came to clear, he congratulated us on a job well done. “But we couldn’t eat those,” I said, pointing to the peppers. “Oh, that’s the best part,” he replied, taking a pepper from my plate in his fingers and taking a big bite, seeds flying out of his mouth and all over me. “Mmmm, very good,” he mumbled, still chewing the pepper while clearing our plates. There was enough of the fish to take home and I offered it to Zio. “Bring it to the Colonel,” I said. We left the remains on the table and walked back out into the slush that was March. As I was walking to the subway, I heard the ping of a text from my cell phone. I took a look. “Fried fresh perch with hot sauce. Not Szechuan, but pretty good” it read. Gerry was sending me a text from the hinterlands. “And there are beaver dams, fox dens and beautiful bird life,” he added, thinking that rustic image might justify the ice fishing lunacy. I thought for a moment as I slogged through the dirty gray slush. Just before heading down into the equally dirty, damp subway I texted him back. “Beaver dams are overrated,” I wrote, clicked send and then made my way to the train with that song (see below) playing in my head.